R package to infer Cancer Progression Models from cross-sectional NGS data of somatic alterations detected in cancer (e.g., SNVs, indels, CNVs, etc.). or from multiple samples of the same patient (e.g., multi-region or single-cell data). describe the evolutionary trajectories that best explain the accumulation of lesions in the input data, and can be visualized as graphs. We used TRONCO to set up the Pipeline for Cancer Inference (PiCnIc). PiCnIc combines tools to diminish the confounding effects of inter-tumor heterogeneity, before exploiting TRONCO's algorithms to infer models from a cohort of independent tumors. TRONCO processes lists of somatic alterations annotated in your sequenced samples; formats such as MAF and GISTIC are supported natively by the tool. TRONCO's functions allow to manipulate and visualize data, to infer models and compute various statistical confidence measures (p-values, bootstrap and cross-validation scores). See TRONCO's FAQs or navigate example case studies. 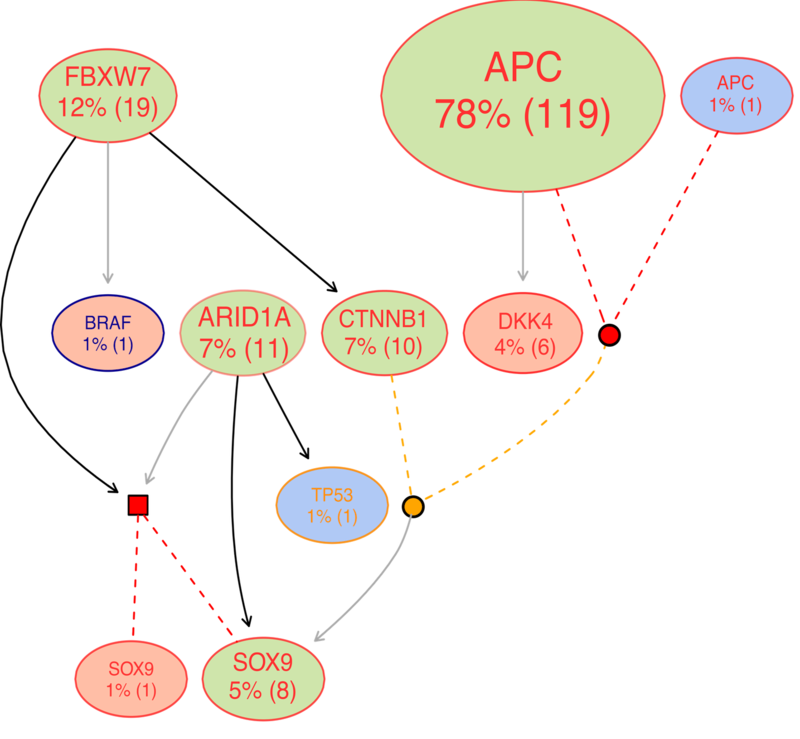 TRONCO's oncoprint is a map of the somatic alterations annotated in the input data. This plot is similar to the Oncoprinter available at the cBio portal. Models are graphs connecting somatic alterations; edges represent selection trends inferred from data. In this examples, we also display CAPRI's logical formulas in expanded form (the smaller red and orange nodes).